White Wolf : Stand by for baby eagles on webcam! 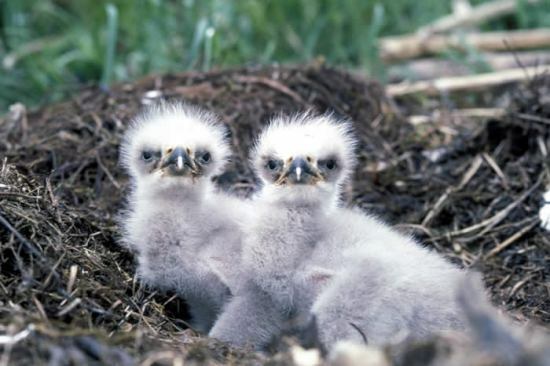 Stand by for baby eagles on webcam! Hey, remember the Decorah Eagle Cam? If you don’t, you probably never saw a baby eagle hatch on live streaming video. But now you have another chance! The mom eagle at the Decorah, Iowa fish hatchery is … pregnant? Do birds get “pregnant”? Anyway, let’s say she has a frittata in the oven. And she’s going to lay those eggs any day now, at which point you can begin obsessively monitoring them for signs of wee tiny eaglets. Responses to "Stand by for baby eagles on webcam!" This is so nice to see. I love it!! So much man made noise - so sad to know they will be deaf when they grow up. Good eyes but deaf. This is so beautiful to see!! thank you for that. ABSOULUTELY AMAZING...SHE IS SUCH A GREAT MOTHER,SO PATIENT,LOVING AND KIND. WE COULD ALL TAKE A LESSON FROM OUR ANIMAL MOTHERS. anyone know how long they've been nesting? Glad to see the third chick, but its so much smaller then the others. May Nature be kind to it. it didn't die! i just saw both parents feeding them. 1 had the 2 older babies and was feeding them. the newest eaglet was being fed just by, i think, the mom. Yeah!!! This is so cool. I watch it every day. aw you guys should turn off the light at night !!! thats not healthy for baby eaglings. or mama eagle for that matter. keep it natural. maybe just dim it down a little!! My two year old granddaughter and I watch this every day. She just loves the babies! Thank you for posting! thank you for showing us around, interesting to see the area. Today is May 9 and where's the Baby Eaglets and Mother? I would love to own that property, listening to the Eagles, with those horses hanging by the barn not tethered or corralled.....how sweet. I can't catch the Eagles in the nest lately. Keep missing them. Please keep Eaglets in view of the camera. If you're not going to do this, you may as well turn off this live feed. If they've left the nest while I was at work for the past couple of days, well darn it. She's sleeping. So peaceful all curled up with her head tucked under her wing. The wind is blowing so she might be cold poor thing. She stood up and turned around but couldn't tell if there were eggs or not. 3 eggs still in nest for past month. Invasion of privacy. If it was a human they be crying all over the place. Oops, maybe only 2 chicks and 1 EGG as now the other white area looks like feathers. About 12:30 PT Dad showed up and Mom left for the grocery store. Dad fed the chicks and then settled down to watch the sports network and keep the chicks warm. I think I saw three chicks and 1 egg. The mom keeps tucking the babies underneath her when they try to squirm out. Yesterday she had a fine coating of snow on her and the nest, but now it is gone. Watched "survival of the fittest" episode here this morning. 1 chick kept getting all the food and when the other tried to get its share, the greedy one sat on its head. Definitely 3 chicks now. Hope Mom & Dad can keep up with the chow they'll need. Being near a fish hatchery should help, if they have access. Thank you so much for zooming in and out, showing the chicks up close and the surrounding area. It was Great!